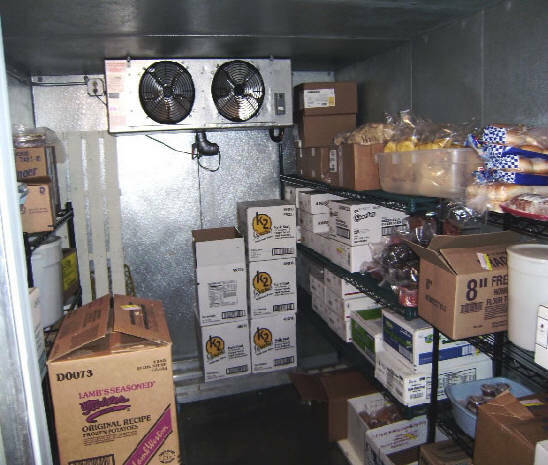 How Your Walk In Freezer Works | Bills Sales and Service - Refrigeration, Ice Machines, Heating and Air Conditioning in the Branson - Tri Lakes Area. Understanding your walk in freezer will save you money and frustration. Many refrigeration problems are caused by not understanding the operation of commercial refrigeration equipment. The basic cycle of cooling and warming is the same as with a walk in cooler . The walk in freezer in this example comes on at 0 degrees Farenheit and runs until the box pulls down to -5 degrees. Then the condensing unit turns off. The air in walk-in warms from door opening, heat gain through the walls and the product. When the temperature reaches 0 degrees, the condensing unit comes on again to repeat the cycle. The evaporator fan runs during the cooling and warming phases described above. The fans do not run if the box is too warm or the unit is in defrost. The air in a cooler is warm enough to defrost the evaporator during the off cycle. If the air temperature in the box is below 35 degrees, a timer needs to be used to insure adequate defrost. The condenser is cut off and the evaporator fans continue to run. In a freezer the air is too cold to defrost the evaporator. A defrost clock cuts the condenser off and cuts on electric heaters. Some units use hot gas to defrost the coil. The evaporator fans are off during the defrost cycle. After the defrost cycle ends the fans are delayed until the evaporator coil has cooled down. This prevents the water from the melted frost from being blown into the walk in freezer. If the thermostat on a cooler is turned too low, the evaporator will freeze. The heaters on a freezer prevent this from happening to freezer. The air in the box may warm during defrost, especially if there is not much product in the freezer. The product temperature should not rise. If the box is warm and the evaporator fans are off, check to see if the product is still frozen solid. Then give the defrost cycle enough time to end. If the unit does not start cooling, something is really wrong.